Here is an awesome article in the New York Times November 14th Edition about Mark Walton. Although most of Disney's animated films typically feature well known celebrity voices, Mark Walton is a Disney animator who was cast for the part of Rhino, an overweight, television-obsessed hamster in the movie Bolt. 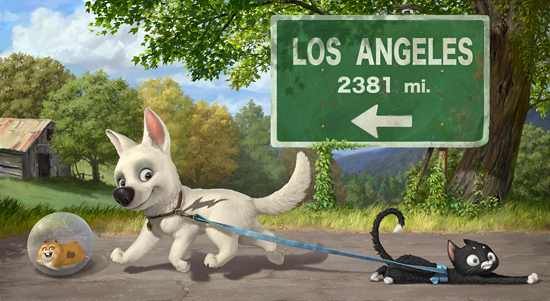 Bolt is Disney's latest film, which COMES OUT FRIDAY!!! It is basically is about a dog who mistakenly thinks he has superpowers. I am excited to see how it ends up - there has been some pressure on the film as it is the first movie that has been overseen entirely by John Lasseter, who recently became head of Disney Pictures as well as Pixar Animation Studios. "[Chris] Williams said he auditioned several actors to voice Rhino (he’s not naming names) but couldn’t find anybody who performed the role better than his slightly peculiar colleague."